3 Bedroom Semi Detached House For Sale in Falmouth for Guide Price £297,500. Located in this favourable residential location, extended and modernised with generous sized family accommodation within. Double glazed, gas central heating, stunning kitchen/diner, living room and a further formal dining room, three bedrooms, private gardens and a generous sized garage located towards the rear of the property. UPVC front double glazed door into porch, being fully double glazed to front aspect, tiled flooring, door and side screen into inner hallway. A very pleasant entrance hallway with stairs rising to first floor landing, access to under stairs storage cupboard, radiator, door to living room and door to kitchen/diner. Double glazed uPVC window facing the front aspect, radiator, attractive feature fireplace with electric heater, built in shelving to one side. 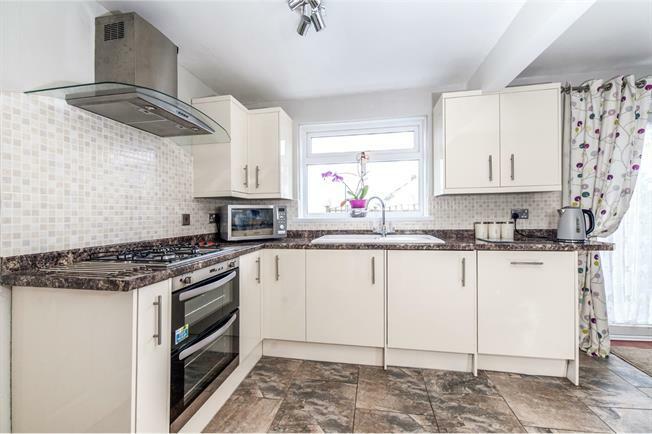 A generous re fitted quality kitchen comprising of wall, base and drawer units with attractive granite effect roll top work surfaces above, breakfast bar area with seating below, integrated oven with four ring gas hob and extractor fan above. Integrated dishwasher, integrated fridge, sink and drainer with mixer tap, UPVC French double glazed doors opening out onto the patio area, double glazed window to rear aspect, radiator, tiled flooring, built in storage cupboard, part tiled walls. A fantastic addition to the property very generous with many uses currently used as a formal dining room, with a utility area to the rear also benefitting from a ground floor cloakroom. UPVC double glazed door to rear garden, double glazed uPVC window facing the front aspect, radiator, tiled flooring. UPVC double glazed window to rear aspect, WC, wash hand basin. Double glazed uPVC window facing the side aspect and allowing plentiful natural light to enter, dado rail, loft hatch and doors to bedrooms and family bathroom. Double glazed uPVC window facing the front aspect, radiator, built-in storage cupboard. Double glazed uPVC window facing the rear aspect, radiator. Two double glazed uPVC windows with obscure glass facing the rear and side aspect, part tiled walls to all water sensitive areas, heated towel rail, laminate flooring, low level WC, panelled bath with mixer tap and electric shower, wash hand basin with vanity unit. The larger than average garage is located close by the rear garden in a block of similar garages. A new up and over door has recently been fitted and benefits from being higher than the standard doors. Gardens to the front are level being laid for ease of maintenance, to one side is a good sized gravelled area with side access to the rear gardens, to the opposite side is an area of lawn. Rear gardens are southerly facing with an attractive paved patio area being ideal for sitting out and entertaining enclosed by fencing with distant views towards Falmouth Bay. A further area of garden is laid to lawn and enclosed with a useful pathway that leads further down to the rear access where the garage can be found.